Giving. Whew, this one can be a doozy. The truth is, your members and visitors want to give. However, they have to be empowered to do so. Easier said than done, right? For one, there are logistical barriers to giving. Perhaps some of your members don’t carry cash or check. Maybe your website has a lengthy login process or maybe you don’t have online giving at all? Secondly, you’re up against emotional barriers to giving. Members may not understand why they should be giving, the act of giving may feel overwhelming to them or maybe they haven’t gotten to connect with leadership just yet. On top of all that, for churches without the right digital solution, manual processes like spreadsheets, multiple accounting systems and offerings zap your staff’s valuable time and energy. All that said, there’s really good news ahead! The tools you need to simplify and expand generosity for both your members and your staff are within reach. With one easy-to-use platform, you can knock down those barriers and create joyful givers by connecting, supporting, and engaging your people. Here’s how we help you do it. Donation Web Page for desktop and mobile. Connect your congregation to your story and make giving super easy with a branded, mobile-responsive page that can be shared across the net from your website to email to social media. In-app giving. Donors can easily give and manage their donations from anywhere, anytime. Registration Forms with Payments. Collect payments through aware3 forms for things like fundraisers, special events, and other purchases. Pledge Management. Give your donors the opportunity to commit to a series of gifts over time with Pledges. Recurring Giving. Make giving easy for your busy donors by allowing them to automatically gift on a recurring basis. Email & Text Receipts. Save time and personalize the donor experience with automatically generated email and text receipts. You can even add a personal touch with customizable email receipts. Crowdfunding. Raise money for specific projects with dedicated giving pages. Then, spread the word across the web, email, and social media with your customized link. Admin Donation Entry for credit card, check, and cash. Easily Log donations that were received offline. We work 24/7 to create an awesome giving experience for your church. Check out these additional aware3 benefits. Donor-covered Fees. Provide a no-pressure option for members to cover your processing fees, so you get 100% of the gift. This helps more go towards your ministry – where it makes a difference. Secure & Streamlined Giving. We don’t want to treat your donors like it’s the first time every time. Allow donors to give with the same passcode across all giving channels, including your website. Giving is iOS Face ID and iOS Touch ID compatible. Reduce Barriers. 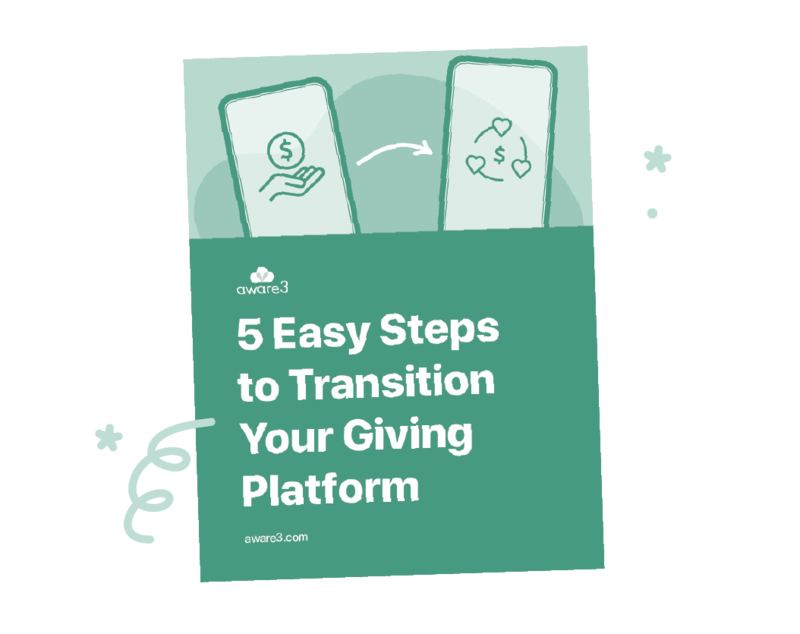 Grow your recurring giving by eliminating common barriers such as a required login before every gift, which is the #1 reason that users abandon the digital giving process. Donors don’t have to have a login for your management system or be a member of your church in order to give. Integration with Church Community Builder and Planning Center Online. If you choose, gifts will automatically write back to CCB and PCO. Real-time Reports and Reconciliation. Easily access all your transaction data through a secure login. Donation management and reconciliation is easy with your quick-access giving dashboard and built-in reporting. Campaign Management. Share your fundraising story, efforts, and the collective impact you’ve made with campaigns. Dedicated Customer and Processor Support. Our support teams provide peace of mind and help you every step of the way. Platform Enhancements. Giving is one of the key pillars of our platform. Our smart giving infrastructure and innovation Engineers are continually monitoring and enhancing your features and functionality. Q – Is my church required to have an aware3 app in order to use aware3-powered giving? A – Nope! We believe that giving is fundamental to all organizations, so our giving platform is available regardless of whether you’re interested in a mobile app. 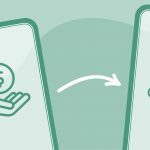 Q – How secure is your giving platform? A – All financial-related data is encrypted and stored by our payment gateway, PaymentSpring. PaymentSpring has earned the highest level of PCI compliance, Level 1. Level 1 PCI compliance is a set of rules stated by credit card companies and audited by an independent third party. Additionally, all transmission to our banking partner and on our site is via an encrypted SSL connection. No financial information is stored on our servers or yours. Q – How will this increase my giving? A – Our church partners using digital giving for the first time on average see a 31% increase in their total giving. Church partners who switch from other giving providers increase their total online giving by at least 5%. Recurring giving, accessibility, and ease of use make more engaged givers. People fueled by generosity in their lives feel more fulfilled and have a greater positive connection to their faith and community. Q – I have an existing giving provider. Do you have any best practices about making the switch? A – Glad you asked! Check out this one-page guide with our tips and recommendations. A – The first step is contacting our expert giving team to get the ball rolling. They’ll get you started with filling out a merchant application and establishing a relationship with our processor, PaymentSpring. You’ll be collecting digital donations before you know it!